There are dozens of cool accessories you can buy for your iPhone, but a flying robot spy with augmented reality has to be at the top of the list. 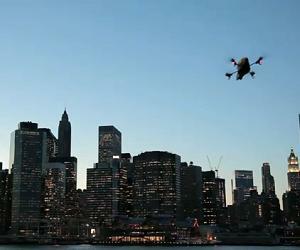 Parrot’s AR Drone is a quadrotor that you can control with your iPad, iPod, or iPhone. It comes equipped with two cameras (one facing forward, the other down) that send their video straight to the mobile device in your hands. Fire up one of its augmented reality apps, and the AR Drone will alter that camera feed so you can see superimposed digital graphics – your flying robot is now a real world video game. First quadricopter that can be controlled by an iPhone/iPod Touch/iPad Thanks to its on-board Wi-Fi system, you can control the Parrot AR.Drone using an iPhone®, iPod Touch®, or an iPad®. It was initially designed for the Apple platforms and will be also available on other platforms in the next few months. You can also control the Parrot AR.Drone from a Linux PC and a joystick with the software AR.Drone Navigation designed for application developers and available for free.